When someone else is at the wheel, we relinquish control to the driver, often leaving us to wonder how diligent the driver is. With the launch of ridesharing in Calgary, questions about the screening process have become an issue. Keys Please® is setting the industry standards when it comes to doing a complete comprehensive background screening process with each and every single Ride Please™ driver they have. Currently, Keys Please® is finalizing the new smartphone app called Ride Please™ – anticipating launch by July, just in time for Stampede. The screening process is a rigorous one. Every driver must have a complete criminal check with a vulnerable sector search. When it comes to the vehicle, The City of Calgary has a standard of the vehicle being no more than 10 years old; however Ride Please™ will set the standard that the vehicle must not be more than eight years old. Plus, every vehicle must be a four-door vehicle with plenty of leg room for the passengers. The drivers must be over the age of 25 and have 10 plus-years’ driving experience. In addition to the uniformed personnel, every driver with Ride Please™ will have the appropriate insurance and appropriate city license (TNDL). Keys Please® will also continue to deliver different driving services such as evening designated drivers. This is the safe solution to getting a driver and their guest(s), plus their vehicle to the destination. Or daytime services that can be used when someone doesn’t feel well at work and isn’t well enough to drive. Or for a medical, dental or optometry procedure. 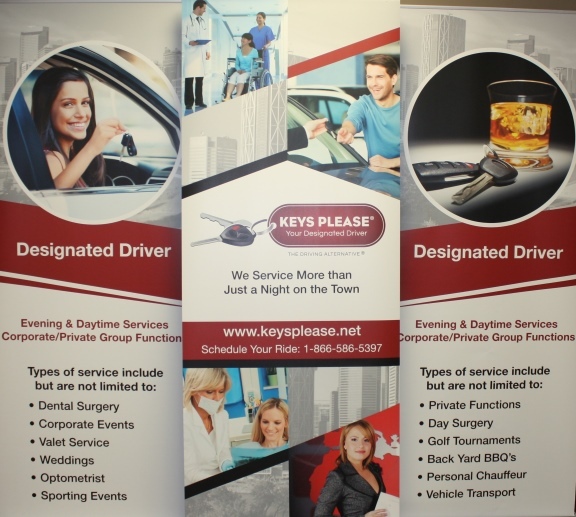 And Keys Please® offers a professional booth that can be placed at events around the city at no charge. Keys Please® personnel will be present to provide information about all their services. Their goal is to set standards for their team of drivers that will instill confidence in the customers.